Food security is an evolving concept used internationally to combat the manifestation of hunger, although operational definitions are often ambiguous and incongruent. Cultural- appropriateness is one factor of food security that has not been clearly delineated, and may be essential in optimizing food security enhancement initiatives in culturally-rich regions. The Richmond Food Security Society recruited the assistance of a team of 8 members from the UBC Faculty of Land and Food Systems to explore how one local demographic values food security. The presented study elucidated how Chinese-Canadian immigrants living in Richmond, B.C. value Western-defined components of food security. Food security parameters were determined following the completion of a literature review detailing Western and Chinese interpretations of food security. An academic definition of food security was established and each definitive parameter was converted into a publically-accessible surrogate for easier understanding before being included in a survey. Surveys were designed to measure respondent's valuation of each parameter’s importance. Surveys were translated into Chinese for respondents’ convenience and back-translated for lexical equivalence. 44 participants were recruited by stratified sampling and surveyed outside libraries, grocery stores, and shopping centres across Richmond. Results were quantitatively analyzed using Excel spreadsheets, ANOVA computations, and linear regression analyses to identify emergent trends in data, and were subsequently qualitatively analyzed to interpret the significance of findings. Findings suggested that all of the Western-defined parameters of food security were perceived as important to the participants, with the healthfulness of food being perceived as the most important, followed by social, environment, convenience, cost, and culture, in descending order of importance. Due to the exploratory nature of the study, additional research was recommended such as conducting interviews with the selected demographic to explore additional factors not acknowledged in the Western definition of food security, augmenting the existing survey with yet-to-be identified factors to be ranked, and creating modified surveys to be administered to participants of Western and other Non-Western ethnicities for comparison purposes. The presented study conceded some limitations including a small sample size, surveyor and respondent biases, time constraints and a translation error. The findings and recommendations of the study were encouraged to be used as a foundation for delineating a clearer, culturally-reflective definition of food security in future research. In partnership with the Richmond Food Security Society (RFSS), our LFS 350 team has been assigned a project to enhance the food security of Richmond, B.C. The LFS 350 course is framed on exploring different “ways of knowing” and grounded in community-based experiential learning. With ample background knowledge in topics such as food security, food sovereignty, and food literacy, our team is well-equipped to investigate food system issues within the community. The RFSS is a non-profit organization striving to achieve food security in the Richmond community. It operates under the mandate “that all people in the community, at all times, have access to nutritious, safe, personally acceptable and culturally appropriate foods, produced in ways that are environmentally sound and socially just” (RFSS, 2014, Mandate). The RFSS is embedded in the Richmond community, actively promoting a sustainable, affordable, and equitable food system in partnership with other organizations. The RFSS has been generous and successful in many community accomplishments. Colin Dring, executive director of the RFSS, has expressed that while steps can always be taken towards food security, it cannot be fully achieved (personal communication, October 30, 2014). In this light, there is an opportunity for our team to identify new steps towards food security in Richmond. Building on previous findings of 2013’s LFS 350 research group, we will explore how food security is defined and perceived by the Richmond community. Food security is ambiguously defined in Western literature, but is essentially an evolving concept that delineates the parameters necessary in mitigating regional hunger. The parameters measured are inconsistently regarded upon, with some academic sources citing the availability of food being more important than the cultural-appropriateness of food production, distribution, and consumption. In addition to these incongruities, it is unclear why Western definitions of food security are currently being used to assess the state of food security in non-Western locations and populations. Perhaps the cultural values of different ethnic populations may dictate variability within the importance of parameters being measured. Therefore, in the context of our community partner’s mission, our research question emerges to respond to a knowledge gap: How do how Chinese-Canadian immigrants living in Richmond, B.C. value Western-defined components of food security? The answer to this question will provide a richer understanding of the cultural nuances specific to the Chinese-Canadian immigrant demographic, and broaden the scope of food security enhancement initiatives in the future. A literature review was conducted to enable us to more clearly define food security by Western standards, explore trends in valuations of food security in China, and substantiate any knowledge deficits worth investigating. Primary, secondary, and grey literature pertinent to how food security is framed in China was obtained via internet Summon, library resources, and consultation with our community partner. Findings highlighted some factors of food security that may be necessary to explore in a Chinese-specific context, and contended an overall necessity in expanding the definition of food security to better address cultural values. As previously stated, our methodology was built on similar research conducted by a Group from LFS 350 (Group 13, 2013). In conjunction with our epistemological and theoretical values, we implemented a mixed method approach. 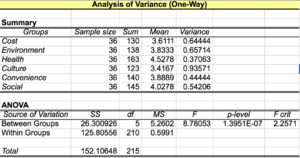 A quantitative approach was used to assign a measurable ranking to our questions, which could be used to create graphs and analyse our findings using one-way ANOVA test (95% confidence interval) and linear regression analysis. A qualitative approach was implemented during the construction of the survey and data analysis. Ultimately, the results of our survey were used to construct qualitative statements of food security from the perspectives of surveyed Chinese-Canadian immigrants. A survey questionnaire was selected as our primary method of inquiry (Creswell, 2003). The survey that we created required direct participation from the Chinese-Canadian community existing within Richmond in form of questionnaires composed of closed-ended questions along with a choice of answers (Creswell, 2003; Taylor, n.d.). We determined that surveys would most clearly identify the parameters that Chinese-Canadian immigrants in Richmond feel are important when assessing food security. It was evident that Group 13 came into problems with jargon, and noted that their interviewers had to independently debrief participants due to the participant’s lack of knowledge pertaining to food security (Group 13, 2013). Since English may not have been our participants’ native language, questions were designed to avoid the confusion that may result from technical jargon and long, open-ended questions. In addition, our Chinese-speaking group members collaborated to translate the survey into Chinese (Mandarin). Thus, participants had the option of answering either an English or Chinese version of our survey. As recommended by Colin, we aimed to have 60 participants complete the survey. Our strategy to recruit participants involved stratified sampling (Atkinson & Flint, 2004); members of our group solicited surveys outside libraries, grocery stores, and shopping centres across Richmond. The first section of questions sought to identify respondent demographic information and served as our inclusion criteria. Participants were asked their age, gender, how long they lived in Canada and Richmond, which province they immigrated from within China, their education level, immigration status, and household income. The last four criteria were not a part of our inclusion criteria, but were requested to be asked by Colin. Figure 1. AAAASS factor surrogates to alleviate potential ambiguity of technical jargon. Surrogates were chosen to reflect publically-relatable aspects of food. The second section of questions served as an evaluation of the Western standards of assessing food security. Our research was constructed on the AAAASS factors of framing food security, but we reclassified the factors into analogous surrogates that participants could relate to and apply to their daily experiences. 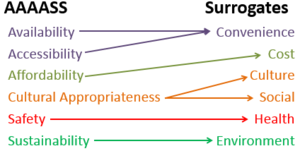 Participants marked each of the surrogates on a scale (adapted from the Likert scale) from 1 to 5; 1 being “not important”, and 5 being “very important”. Data from the second section was analyzed using numerical data as evidence to support qualitative conclusions. The importance of each factor ranked would identify patterns to be considered when measuring food security. A third section was devised to answer a secondary research question, an elaboration of which and its corresponding data can be found in Appendix C.
Yoshizawa and Phung (2011) have elucidated the presence of racialization in the Lower Mainland food system with consequences on the balance of food security. Hence, during this research, our ethical responsibilities were driven by a campaign for social justice among Richmond food citizens as part of our moral commitment to enhancing food security, which we believe should be a fundamental right for all. Surveys abided by the Government of Canada’s Tutorial on Research Ethics (TCPS). For example, anonymous responses were recorded in a password-protected Excel spreadsheet. CBEL involved conducting research as well as service learning through an opportunity to volunteer at events hosted by the RFSS. Community-based research provided an opportunity to address a question relating to food security which required learning through various sources including: collaborating with the community stakeholder, discussing with peers, reading articles relating to research topic and listening to lectures. By critically thinking about what each of these learning experience offered, key themes were drawn and linked together to carry our research forward. Our research was largely governed by the project charter and Colin. Meetings with Colin provided an opportunity to receive feedback on our charter, which lead to revisions to our research question and methodology. For instance, we limited our participant criteria to a single visible minority group: the Chinese-Canadian residents of Richmond. Additional feedback was provided by Colin’s assistant, Lucinda, via email. Community Service Learning (CSL) provided a means to deconstruct our personal experiences in the field and consider what aspects of theoretical knowledge we can connect it to. Of 44 participants, 8 participants are not residents of Canada and have been excluded from our analysis. Of the 36 participants, 29 (80%) have lived in Richmond less than 10 years while 7 (20%) have lived in Richmond for more than 10 years. No participants expressed confusion interpreting the surrogate terms for food security parameters listed. Figure 2. 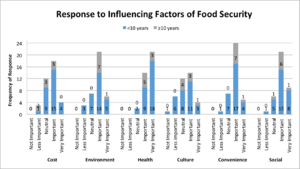 A one way-ANOVA test showing that the levels of importance assigned to factors influencing food security are significantly different (p<0.05). The ANOVA test indicated that there were differences found between and within our food security parameter surrogates. Figure 3. A histogram illustrating responses to different influencing factors (i.e. cost, environment, health, culture, convenience, and social). Each histogram shows a left-skewed distribution. Among the factors, the response to health is heavily left-skewed, with the highest frequency of 21 (58%) responses falling under the “very important” classification. The modes of other factors (cost (f = 18), environment (f = 21), culture (f = 14), convenience (f = 24) and social (f = 21)) fall under the “important” classification. 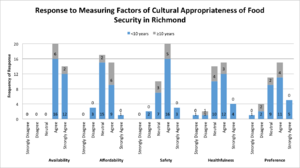 The distributions of responses to cost and culture offered by participants living in Richmond more than 10 years are right-skewed, which are different from the distribution of the response offered by the participants living in Richmond less than 1 year. After decompressing surrogate factors back into their AAAASS counterparts, our data suggests that Chinese-Canadian immigrants have a similar interpretation of food security compared to the Western standard. An overall agreement on the importance of different influencing factors was observed; no factor was unanimously dismissed as unimportant. However, the levels of importance vary between and within the AAAASS factor surrogates. For instance, health was widely regarded as most important, followed by social, environment, convenience, cost, and culture. The safety of food appears to be a major factor of food security for Chinese-Canadian immigrants. In addition, although both social and cultural factors refer to cultural appropriateness, the level of importance of these two factors is not equal - social factors outweighed cultural factors. This finding has not been clearly examined by other literature. Moreover, the level of importance on environment is higher than the level of importance on convenience. Accordingly, Chinese-Canadian immigrants may undergo a transition from mainly focusing on food accessibility to incorporating a sustainable food system into the conceptualization of food security. Other than the connections that were made amidst the results, some auxiliary trends were also observed by comparing results across demographic factors. We observed a positive correlation between income level and perceived importance of cultural factors of food preference as well as environmental factors. Among the income levels, participants in the $20,000 to $29,999 level had very similar perceptions of the cost, convenience, and social factors. Additionally, a decrease in the average rating for importance of culture was observed after participants had lived in Canada for 5 years. However, this estimate was not supported by linear regression analysis. Our conclusions may have been confounded by several limitations, with time constraints and sample size affecting our study most prominently. Provided the allotted time, we were only able to acquire 36 usable responses of the 60 we had planned. The smaller sample size may not accurately reflect the true population estimates. Further, we selected substitute factors to address the Western interpretation of food security. These surrogates may have led to a measurement bias due to possible misinterpretations of how food security is defined. Respondent biases may have emerged if participants wanted to project a positive self-image by falsely representing their true perceptions. Additionally, the data could not be effectively compared against a standard since our study did not survey Western participants. A blunder resulted when one question was inadvertently omitted from the translated survey despite being back-translated for equivalence. Lastly, survey modifications were brainstormed after surveys were completed and could not be added into our data sets due to time constraints. Our results can be compared with a study that obtained a conceptualization of food security by various United Kingdom farmers. The study found that there was a wide range of definitions of food security developed by the farmers, where safety, quality and traceability of food were perceived as most important and affordability of food was seldom included (Fish et al., 2013). Similarly, our study found that the factors comprising the Western definition of food security are all important factors for Chinese-Canadian immigrants living in Richmond. More precisely, we found that health (a surrogate for safety) was perceived as most important, while cost (a surrogate for affordability) was considered as least-important. Drawing from our data, we found that many of the Chinese-Canadian immigrants valued the health factor of food the most. Potential food-security enhancement strategies in Richmond may focus on educating residents about food nutrition and safety rather than strictly targeting the availability and accessibility of food. Information such as what kind of local foods benefit health, where they can be obtained, and how to prepare them may be most useful for Chinese-Canadians. Divergence is seen in the conceptualization of food security by various groups of individuals (Allen, 2013). Our recommendation for future research is to conduct interviews to allow participants to elucidate unacknowledged factors that define food security. Furthermore, Brunori et al. (2013) found that the definition of food security evolves over time within a group, emphasizing a need for timely and consistent surveys to obtain the most current information. Since Richmond is populated with many different ethnic groups, we recommend investigating the conceptualizing of food security of each ethnic group. To achieve this, further research may adapt the methodology of our survey to Western and non-Western ethnic Richmond residents. Comparing the conceptualization of food security among different ethnic groups will improve food security enhancement initiatives in Richmond. The term food security is an evolving concept and is ambiguously defined in Western literature. Many operational definitions seem to attribute the availability and accessibility of food as exclusively important factors to consider when designing strategies to mitigate regional hunger (Allen, 2013). However, in Western literature, temporal, spatial, financial, and social factors of accessibility have been included or omitted in various definitions of food security. For instance, food security measurements, such as the Global Food Security Index and Global Hunger index currently address few of the many components of food security (Jones et al., 2013). Further, when national governments orchestrate initiatives to mitigate food insecurity, the vagueness of terms like “accessibility” becomes more apparent and deleterious consequences to the hungry may be perpetuated. Canada has been criticized for failing to mobilize resources to address food security effectively, and the ambiguity of the term “food security” may be a contributing factor to consider (Food Secure Canada, 2014, Right to Food). Assigning a concise definition to food security would equip scholars and organizations with a tool to fight hunger more effectively. While such a definition has been presented by the UBC Faculty of Land and Food Systems, certain considerations have still been overlooked. For instance, nuances unique to marginalized cultures have not (and cannot, potentially) be reflected in a single, generalizable definition of food security. The purpose of this review is to explore a concise Western definition of food security, and explore its inadequacies in serving food-insecure Chinese-Canadian immigrants. Western definitions of food security will be investigated, and compared to Chinese definitions and trends found in Chinese literature. While availability and accessibility are crucial albeit vague dimensions to acknowledge, numerous definitions of food security have generated a more comprehensive understanding of how hunger manifests and how it impacts populations. The United States Department of Agriculture defines food security as: “access by all people at all times to enough food for an active, healthy life and includes at a minimum: a) the ready availability of nutritionally adequate and safe foods, and b) the assured ability to acquire acceptable foods in socially acceptable ways (e.g., without resorting to emergency food supplies, scavenging, stealing, and other coping strategies)” (Renzaho & Mellor, 2009). 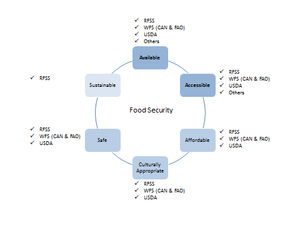 Further, the USDA describes ranges of food security, from “High” to “Marginal” labels assigned according to the accessibility of food (USDA, 2014, Ranges). The Canadian Department of Agriculture’s understanding of food security operates by the 1996 World Food Summit definition that has also been adopted by the FAO: “food security exists when all people, at all times, have physical, social and economic access to sufficient, safe and nutritious food which meets their dietary needs and food preferences for an active and healthy life” (Government of Canada, 1998; FAO, 2014). Canadian dietitians have been found to define food security differently amongst themselves, where certain components were rated more important than others (Power, Sheeshka & Heron, 1998). The Richmond Food Security Society confers the following definition: “That all people in the community, at all times, have access to nutritious, safe, personally acceptable and culturally appropriate foods, produced in ways that are environmentally sound and socially just” (RFSS, 2014, Mandate). Within the Faculty of Land and Food Systems at the University of British Columbia, food security has been a centralized topic related to social, health, and environmental issues. Faculty members have defined food security according to the following factors of food: availability, affordability accessibility, culturally appropriateness, safety, and sustainability (Wittman & Valley personal communication, November 12, 2013). Delineating each factor into individual concepts is effective, but some ambiguities still require demystifying. For instance, Alejandro Rojas of the UBC Faculty of LFS acknowledges different dimensions within the “accessibility” factor including spatial, temporal, economic, and social distancing (Rojas, Valley, Mansfield, Chapman & Harlap, 2011). Spatial accessibility is clear to understand, while temporal distancing is better understood as “availability” since food may not be produced or transported year round. Similarly, economic distancing may be better understood as “affordability.” Lastly, social distancing could be categorized under cultural appropriateness, but may also be better identified autonomously according to different cultures’ appraisal of its importance. Figure 1. A Harmonized Western Definition of Food Security. Terms included in various Western definitions of food security were tallied and assigned to the AAAASS definition generated by the UBC Faculty of LFS. Emergent trends include the overemphasis on availability and accessibility of food and underemphasized importance of sustainable practices to produce food. Figure 1 summarizes the various perspectives of food security into a harmonized and operational definition according to Western literature. From this figure, it is clear that certain dimensions of food security are weighted more or less than others by Western standards. It remains unclear how other cultures define food security – do they place the same emphasis on similar factors, or include additional factors not considered by Western academics? The following section will explore how Chinese scholars and agencies perceive the importance of the same factors of food security as Western standards, and identify others that are not acknowledged by Western standards. Additional cultural factors not considered by Western standards have been highlighted by Renzaho & Mellor including: cultural beliefs, practices, attitudes, power processes, gender-specific roles and responsibilities, and decision-making hierarchies (2009). Further, Renzaho & Mellor also stresses the importance of utilization and asset-creation factors when considering culturally pluralistic conceptions of food security, which could both be classified as factors pertaining to sustainability (2009). While a Summon search of Chinese definitions of food security yields unsatisfactory results, a working Chinese-definition of food security may be extrapolated by reviewing and analyzing various literature sources pertaining to assessing food security in China. The following section will paint a picture of China’s state of food security and examine how food security is being assessed. Over the past 30 years, China has seen a transformation in its state of national food security. Population growth coupled with growing income levels has strained food supply and demand (Liao, 2010). Government initiatives across the continent instigated an Asian “Green Revolution” in the mid 1970’s, which saw investment in irrigation and infrastructure to support high-yielding crops such as rice (Jayasuriya et al., 2013). In the 2000’s, government-sponsored policies boosted grain production further, leading to near-complete self-sufficiency in national food production within the decade (Liao, 2010). In fact, excess food production led to China being a net-exporter of cereal grains, and some food would be illegally smuggled to outside regions (Liao, 2010). Therefore, government-subsidized food production strategies are clearly beneficial in achieving national self-sufficiency. However, assessing regional food security according to self-sufficiency focuses myopically on the supply-side of food production. The economic perspective of food security largely ignores the extraneous burdens of increasing demand and the various other factors targeting hunger mitigation. For instance, during the Asian Green Revolution, arable land ideal for crop production was transformed into urbanized zones - a sacrifice that does not benefit food security (Liao, 2010). Further, sustainable food production in China is largely attributed to small farms (Liao, 2010). If these small farms are pressured to continually produce more food in an effort to maintain national self-sufficiency, their sustainable methods may be compromised. Lastly, while large economies of scale are the most efficient means of producing commodity foods, using these foods to address food security may not provide adequate nutrition and variety to fuel active, healthy lifestyles. One report serving to assign a spectrum of food security levels to China designated the country as being “a little bit secure” (Chinese Securities, 2014). The factors this report based the designation on pertained to the availability and accessibility of food, which as discussed earlier was definitively achieved through the Asian Green Revolution. Additionally, other reports have consistently found China to be more food secure than insecure as based on the same two factors. However, ascribing the designation of “food secure” may be disingenuous if other factors that mitigate hunger are not considered. If food in China is not being produced sustainably, food production will inevitably decrease until food security is lost. If food is not delivered in socially just or culturally appropriate ways, marginalized individuals will continue to be hungry. Therefore, designating an entire country as “food secure” may divert attention away from many hungry people. In fact, evidence has suggested that different regions in Western China experience food insecurity, implying a difficulty in fairly distributing food (Li & Yu, 2010). What Matters to Chinese Citizens? Reports determining China’s food security status have highlighted various factors consistent with the Western model of food security. An emphasis on matching national food production with national demand is consistent with adequate availability of food, which can be linked to self-sufficiency (Liao, 2010; Jayasuriya et al., 2013). Further, accessibility is included in food security discourse, but is not clearly explicated upon in reports (Liao, 2010; Jayasuriya et al., 2013). Technological advances, food prices, and output stabilization are considered important factors of achieving food security by government initiatives (Jayasuriya et al., 2013). A popular health belief in Chinese medicine is the Yin and Yang theory (Satia-Abouta, Patterson, Kristal, Teh, & Tu, 2002). The theory states that opposing and complementary forces, Yin and Yang, need to be in perfect equilibrium to maintain harmony and balance (Satia-Abouta et al., 2002). All things, including food, are considered as either yin or yang (Satia-Abouta et al., 2002). Classifying as yin and yang as a cultural preference is an example of a component of food security not addressed by working definitions in Western literature. So far, this review has determined, as suggested by Renzaho & Mellor, that measurements of food security used in China are biased towards Western standards, and do not consider culturally-specific factors like utilization and asset creation, or Chinese-specific factors like “yin and yang” (2009). The remainder of this review will explore pragmatic strategies to research and apply a culturally-reflective definition of food security. Ethnic Chinese make up the largest Asian subgroup in the USA and Canada, and constitute one of the fastest growing populations in North America (Satia-Abouta et al., 2002). A study conducted on Chinese-immigrant dietary acculturation concluded that efforts to enhance food security should target the eating practices of young, educated, and employed Chinese-immigrants living in North America; despite food being available, it may not be culturally-preferred or meet other standards of food security (Satia-Abouta et al., 2002). Chinese food preferences are largely based on cultural eating patterns and thus, when optimizing regional food security, cultural preferences for food should be addressed accordingly. An exploratory study conducted by a research team from the LFS Faculty of UBC in 2013 sought to understand the culturally-specific state of food security of Chinese-Canadian immigrants living in Richmond, B.C. Interviews were conducted, translated, and analyzed, and findings suggested that food insecure Chinese immigrants may rely on alternate means of procuring food than previously thought. Family and friends were found to be a common safety net for the food insecure, while food banks and organized support networks were frowned upon due to perceived social stigmatization. The study also found that local, Chinese take-out food was commonly sought after by Chinese-immigrants. While this food may satisfy the available, accessible, and culturally appropriate factors delineated by the AAAASS definition of food security, it often does not meet the safety or sustainability criteria, and arguably is not affordable to the entire demographic. Therefore, before considering factors that are not included in the Western definition of food security, there may be a large and unrecognized gap in food security in the Chinese-Canadian immigrant population. Thus far, it has been established that the amalgamated Western definition of food security is effective in assessing regional food security and constructing strategies to mitigate hunger. However, it remains unclear if this definition is the most effective definition to follow. For instance, Renzaho & Mellor posit that certain aspects of food security are not adequately addressed in the traditional definition, such as utilization and asset creation. Summon searches have indicated no specific factors being unaddressed in contemporary Chinese valuations of food security. Therefore, this knowledge gap necessitates further exploration in order to construct a more effective, culturally-specific definition of food security. Further, culturally-specific definitions beyond that pertaining to Chinese would be beneficial in eliminating hunger worldwide. Hence, the argument presented suggests a series of ethnographic studies aiming to elucidate the specific factors of food security that are most and least important to individuals of different ethnic backgrounds. Emergent trends may be useful in constructing or augmenting existing food security enhancement initiatives world-wide, according to each culture’s definition. Within the scope of our primary research question, a secondary research question seemed suitable to ask in order to better understand the current state of food security in Richmond, B.C. To delineate our chosen demographics’ preference for traditional Chinese food and its role in mitigating food insecurity, our study will also address the question: “How do Chinese-Canadian immigrants living in Richmond, B.C. perceive traditional Chinese food in the context of Western food security factors?” The third section of our survey sought to illuminate Chinese-Canadian immigrant perceptions of the current level of “cultural appropriateness” of food security in Richmond, B.C. The questions were designed to measure the availability, affordability, preference, healthfulness, and safety of traditional Chinese food compared to Western food in Richmond. Parameters were measured using the Western definition of food security. While this method seems slightly paradoxical with our research question (i.e., using the Western definition of food security to assess food security in a cultural community when our research question aims to prevent just this from happening in the future), the Western framework is currently the best indicator we have to use. Participants were to state how strongly they agree with each statement, on a scale from 1 to 5; 1 being “strongly disagree” to 5 being “strongly agree”. Data from the third section was analyzed similarly to the second section. Figure 4. A one way-ANOVA test showing that the levels of perception of traditional Chinese Food according to factors influencing food security are significantly different (p<0.05). Figure 5. A histogram displaying respondents’ perceptions of traditional Chinese food pertaining to its safety (f = 21), healthfulness (f = 15), and their preference (f = 15) of, in the context of the cultural appropriateness factor of food security. The graphs in figure 5 share a similar left-skewed pattern, with each mode falling under the “agree” classification. Although the mode of availability (f = 22) also falls under the “agree” classification, there were no responses in the “strongly disagree,” “disagree,” or “neutral” options, which suggests an overall agreement among respondents on the availability of traditional Chinese food. Affordability (f = 17) has a mode falling under the “neutral” classification. However, within the response to affordability, the mode obtained from the response of participants living in Richmond more than 10 years is under the classification of “agree,” differing from the overall mode of affordability. Figure 6. Linear regression analysis examining the correlation between Richmond Chinese-Canadian immigrants’ income level and perception of the importance of cultural factors when considering food. Analysis suggests a positive relationship. 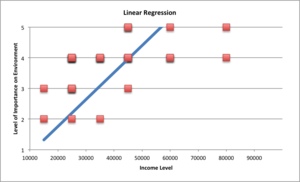 Linear Regression Analysis In order to identify emergent trends within the demographic we were studying, we analyzed survey responses according to response variables against income level. Two trends were noteworthy and have been included in graph-form by Figure 6 and 7. 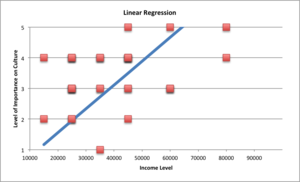 Of the 36 participants that fulfill the inclusion criteria, 1 participant had an income level >150,000, which was classified as an outlier for linear regression analysis, and was subsequently excluded. Therefore, only the responses of 35 participants were used. Figure 6 and 7 suggest a positive linear relationship between income level and the level of importance on environment and culture factors. As income level rises, respondent appraisal of environmental and cultural factors increase. However, there is no noticeable trend been between income level and the importance of cost. Nonetheless, more studies and more factors should be incorporated to obtain a comprehensive Chinese-Canadian perspectives on food security in order to better develop strategies on the overall improvement of food security. Apart from what have already been described under the previous results section, the survey results have also illustrated various additional trends. The first trend that we have found was for the factor availability when measuring the cultural appropriateness of Traditional Chinese Food in Richmond. Although the mode of availability falls under the “agree” classification, none of our respondents has chosen the options “strongly disagree,” “disagree,” and “neutral”. This result has shown an overall agreement on the availability of the traditional Chinese food in Richmond. Other than availability, we have also observed an interesting trend for the factor affordability, which has a mode that falls under the “neutral” classification. However, we have found that the mode calculated from the response of participants who has been living in Richmond for more than 10 years falls under the classification of “agree”, which differs slightly from the overall mode of availability. This is the factor that shows the greatest difference between the two groups and a reason to this slight difference would be due to participants who have been living in Richmond for a longer time period are more likely to find jobs as they are able to improve their language proficiency. Auxiliary Trends based on Mean Responses. Allen, P. (2013). Facing food security. Journal of Rural Studies, 29, 135-138. Group 13. (2013). Food security speak: An investigation of food security language among ethnocultural groups in Richmond. Jones, A.D., Ngure, F.M., Pelto, G. & Young, S.L. (2013). What are we assessing when we measure food security? A compendium and review of current metrics. Advances in Nutrition. 4(5), 481-505. Royal, K. D., Ellis, A., Ensslen, A. & Homan, A. (2010). Rating scale optimization in survey research: An application of the rasch rating scale model. Journal of Applied Quantitative Methods, 5(4), 607-617. Wittman, H. & Valley, W, personal communication, November 12, 2013. ↑ Organizations in partnership with RFSS include the Richmond Food Bank Society, the Sharing Farm Society, and Richmond Pocket Markets (RFSS, 2014, Partners). ↑ Community accomplishments including the Richmond Food Charter, Local Food Map, and the Good Food Access program, garden mentoring programs and food accessibility literature (RFSS, 2014, Publications). ↑ The literature review can be found in Appendix A. ↑ The survey can be found in Appendix B. ↑ Our inclusion criteria: Resident of Canada; Older than 19 years of age; Emigrated from China. ↑ The last two sections of our survey utilized scales with varying ranges and response options (Royal, Ellis, Ensslen & Homan, 2010). There is a risk of using too few categories “which can result in inaccurate findings due to “lumpy” data, or too many categories which can result in better accuracy but also more confusion for the respondent” (Royal et al., 2010, p. 608). Thus, a rating scale of 5 in both sections was chosen. ↑ Reflections of each of our team members’ personalized CBEL experiences can be found in Appendix E.
↑ See Appendix D for computations of auxiliary trends. This page was last edited on 10 December 2014, at 18:59.